Ever-interested in dialogue about the state of music in Japan and its relationship to the US, in 1988 Music From Japan hosted two days of symposia, “Music Education in Japan – II.” Among the topics covered were the Yamaha Music Education System and the Suzuki Teaching Method. 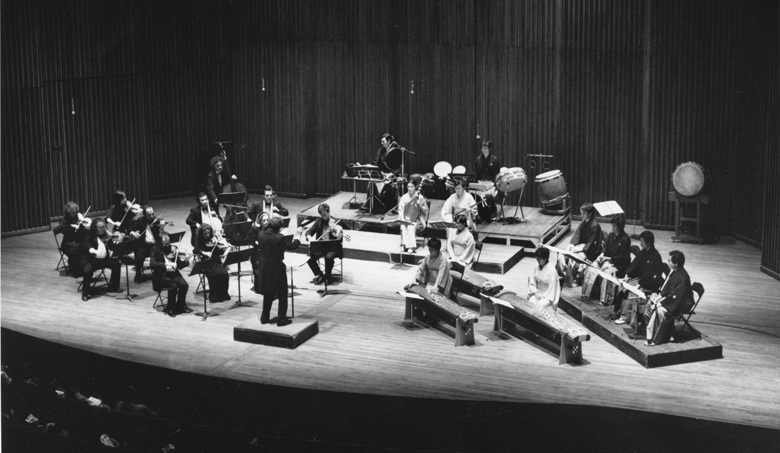 On March 2nd, 1988, Music From Japan traveled to Ann Arbor, Michigan to present its program “Orchestral Encounters,” which featured Pro Music Nipponia of Japan and The University of Michigan Percussion Ensemble. The ensembles performed both traditional and contemporary pieces, mostly composed by Japanese musicians. The exception was “Ryoanji” (1986) by John Cage. The ensembles traveled to Detroit’s Orchestra Hall on March 4th to perform more music. After performing in Detroit, Pro Musica Niponnia traveled back to New York City to perform in a marathon concert at Asia Society that was broadcasted on WNYC. In the program note, Mr. Miura explains that the goal of the marathon concert was to demonstrate traditional Japanese instruments and showcase the phenomenal abilities of the individual members of the ensemble. On March 9th, Pro Musica Niponnia performed once again with the University of Michigan Percussion Ensemble and the Brooklyn Philarmonic Chamber Orchestra at Alice Tully Hall. To conclude Pro Musica Niponnia’s US tour, the group traveled to Los Angeles to perform at the Japan America Theatre.